Business Process configuration constitutes a powerful tool for expressing similarities between different Business Process models. Such models in the case of real life systems are often very complex. Configuration gives the opportunity to keep different models in a single configurable model. Another approach to manage model complexity is hierarchization, which allows for encapsulating process details into sub-levels, helps to avoid inconsistencies and fosters reuse of similar parts of models. In this paper, we present an approach for configuring Business Processes that is based on hierarchization. Our approach takes advantage of the arbitrary \(n\)-to-\(m\) relationships between tasks in the merged processes. It preserves similar abstraction level of subprocesses in a hierarchy and allows a user to grasp the high-level flow of the merged processes. We also describe how to extend the approach to support multi-level hierarchization. 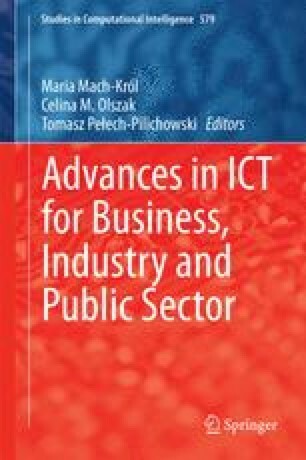 The authors wish to thank the organizers of the ABICT 2013 workshop on the FedCSIS 2013 conference for providing an ample environment for presenting and discussing our research.